We produce the most complex of shapes from almost any machinable material. Our ultramodern CNC machinery and CAM software enable us to produce the most complex of shapes from almost any machinable material. 3DTechDraw machines both metals and non-metals: anything from stainless steel, to plastics, titanium and inconel. Our close-knit team of specialists can transform your design into a technical drawing, a prototype or even a complete product series. We would be happy to talk to you about production possibilities. With the slightest of tweaks to the design, a product can be sometimes produced much more easily, with all the ensuing benefits. We are constantly seeking out innovation in order to guarantee the perfect finished product. 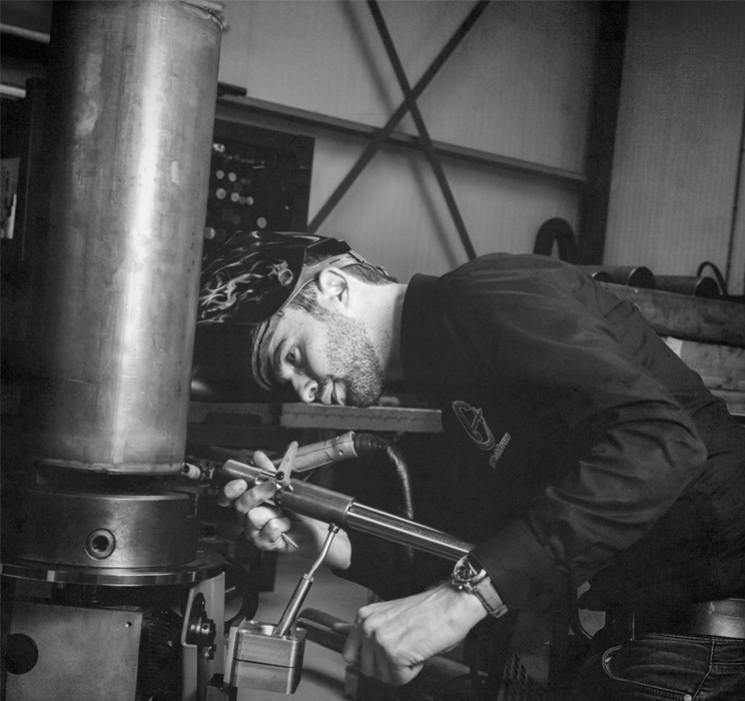 From precision engineering to machine construction. 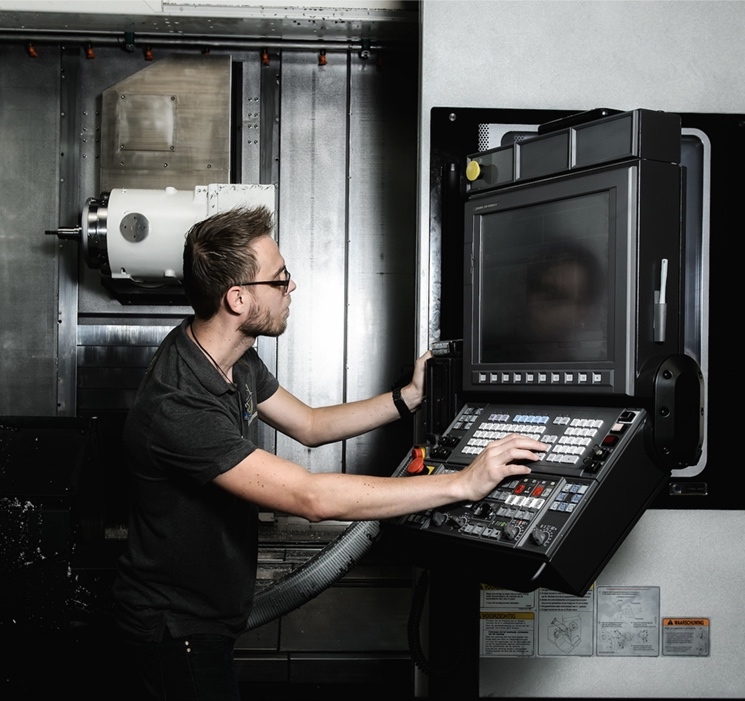 Our ultra-efficient machining process is made possible thanks to our advanced machinery and specialised team, as well as our in-house stocks of widely used materials. Orders - whether urgent or not - can be produced and delivered within very short lead times. In fact, almost nothing is beyond us! Our constant pursuit of innovation to improve the production process and quality and to shorten lead times resulted in the acquisition of the Cobot in 2017. 3DTechDraw has developed a loading cell with multiple loading trays for this collaborative robot, which means that a large number of products can be loaded on the smallest of surfaces. At nighttime too, since Cobot continues working even when everyone else has gone home. Automation aside, extensive digitisation has been helping us to maximise quality and speed. Our support processes, from sending out quotations to invoicing, have been fully digitised. We always have the latest technical drawings and product information on file, so preventing any errors. We store modifications we make to workpieces too, so that we can always refer back to earlier versions. Jasper Wijnschenk first got involved with 3D drawings working in his parents’ attic in 2008. This ultimately gave rise to a business which, quite appropriately, he christened ‘3DTechDraw’. When Jasper was given the chance to acquire machines from a metalworking business, he moved to a production unit in Asch. There, working with traditional lathes, milling machines and welding equipment, he started machining and metalworking production activities. 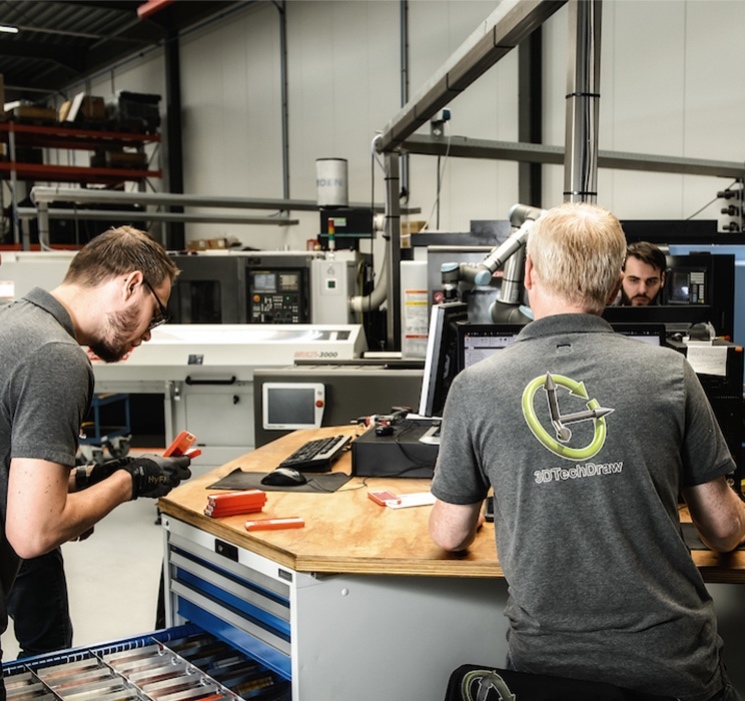 3DTechDraw underwent rapid growth and soon investments were being made in CNC machines, so that operations became even more accurate and efficient. In 2011, cousin Mark Mastenbroek and later brother Laurens Wijnschenk joined the embryonic business. Having outgrown its original business premises, in 2013 3DTechDraw moved to Culembourg. Persistent growth led to a further relocation within Culemborg, with the addition of three new members of staff. Our team of enthusiasts at 3DTechDraw now totals seven: Jasper Wijnschenk, Laurens Wijnschenk, Mark Mastenbroek, Bryan Casey, Adriaan de Wit, Margo Wijnschenk and Wim Walkot. They each have their own specialisation in the field of milling and turning and are all able to work on several machines. We are a versatile and close-knit team where quality is the absolute prerequisite. Want to find out more about our experts?